St. Martin's Paperbacks, 9781250132703, 320pp. They are part of an elite unit. On task. Off grid. These are the men of the Shadow Ops task force. 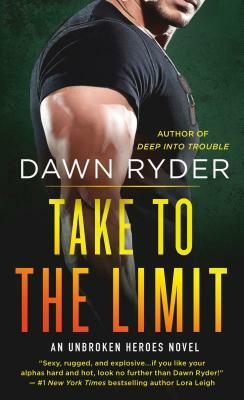 Be seduced and thrilled by Take to the Limit, the next Unbroken Heroes novel by Dawn Ryder. A hardened military machine, Bram Magnus is a tough, combat-ready, all-American hero who never surrenders. But the one thing he can’t fight? His smoldering, intense attraction to his girlfriend’s younger sister. He’s always kept his feelings locked deeply down. But when his girlfriend betrays him the night before he ships off to Afghanistan, Bram has one chance to show the woman he’s resisted for years that he wants her as fiercely as the first day he saw her. Ever since her older sister first brought home the soldier with steely hard muscles and piercing eyes, Jaelyn has wanted Bram, and when her sister casts him aside the night before he leaves, Jaelyn can’t resist one steamy hot kiss with him. But danger is not far behind, and even as a deadly enemy hunts them, their relationship only grows more explosive. It’s all Bram can do to keep Jaelyn safe, but with a threat this powerful, will they pay the ultimate price for their passion?